Why are ServiceNow MSPs Choosing Evanios? Managed Service Providers (MSPs) have to deal with complex infrastructure and varying customer needs around monitoring, event management, incident resolution and analytics. 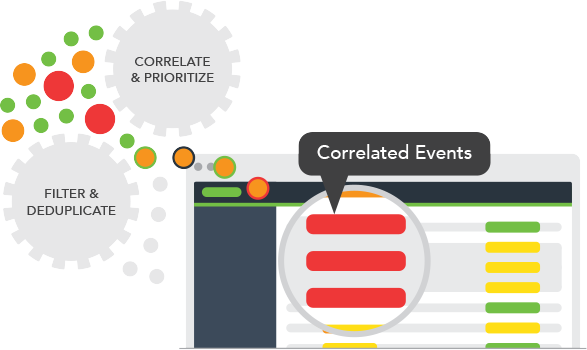 Evanios’ Unified Event Correlation & Monitoring Platform enables MSPs to offer flexibility while anticipating and automatically remediating service impact directly from the ServiceNow platform. Establishing a single pane of glass for centralized control of your environment is key to driving efficiency. The ability to segregate customer data (ServiceNow calls this domain separation) is also critical. Evanios consolidates event and metric data in a familiar, highly scalable cloud architecture. 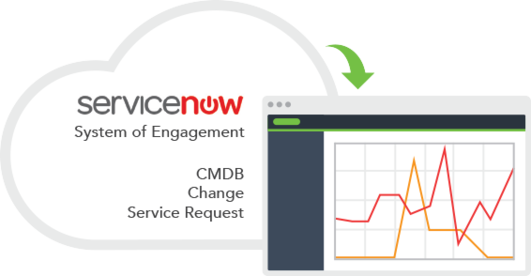 ServiceNow Managed Service Providers can enrich and transform all events before they are sent to the cloud, and integrate all monitoring tools into ServiceNow via dozens of pre-packaged, supported integrations that deploy quickly & easily. Events are easily collected from ANY source through open API’s. 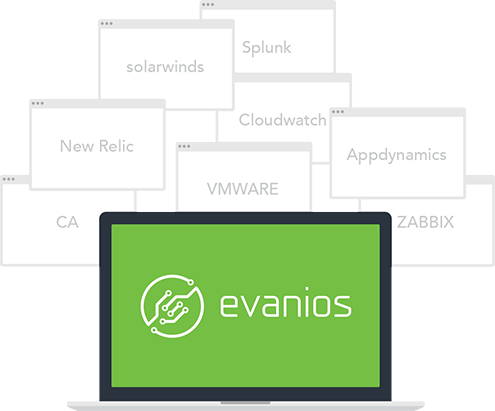 Evanios offers dozens of prebuilt integrations that are ready to download and go. There is also an open integration toolset that supports common integration methods such as SNMP, Web Service, Command Line Client, REST, etc. Custom integrations quickly enable complete coverage of the IT landscape. 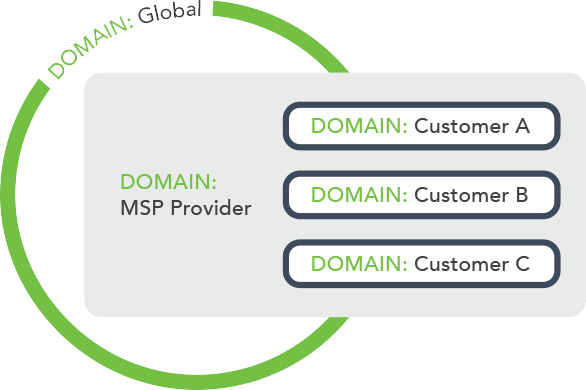 Domain separation is particularly valuable for ServiceNow Managed Service Providers who need a standardized way of offering and managing various management tools, used by many different customers, in a single multi-tenant ServiceNow environment. Integrate, augment, or replace your existing monitoring tools. Evanios monitoring is configured directly in the ServiceNow platform and offers unprecedented levels of integration with ITSM processes (e.g. Change Mgt, CMDB). Lightweight monitoring sensors are easy to deploy and maintain, while extensibility enables ServiceNow MSPs to have full coverage of the IT and IOT landscape. Additionally, Evanios monitoring sensors can be auto-provisioned and integrated into your existing change, CMDB, or service request workflow (via templates, or tailored to unique processes) in order to reduce labor, human error and coverage gaps. “Evanios makes it simple to integrate various Systems Management tools into a domain separated ServiceNow environment that offers event correlation, auto-provisioned monitoring and predictive analytics." Reduce noise and improve Intelligence by correlating events into fewer, prioritized incidents in ServiceNow. ServiceNow MSPs eliminate unnecessary alerts and low-level manual decision making by leveraging advanced algorithms that group related events into parent-child relationships based on contextual data such as CMDB topology, time, and event content. Evanios will identify and prioritize actionable events, and merge multiple events into a single, enriched ticket, automating incident creation and resolution while maintaining all relevant event data and even triggering automated remediation actions. As a ServiceNow MSP, what if you were able to identify and resolve leading indicators before they cause critical outages? What could that mean for your customer acquisition and retention? Evanios analyzes events using extensible machine learning algorithms for advanced scoring, root cause analysis and event prediction. Automatically identify why failures occurred, and identify leading indicators while visualizing both actual and predicted impact. The extensible framework quickly adapts for unique environments, while Service Status Analysis combines data from all sources into a shared, unified view of IT health. Concerto Cloud Services is a fully managed cloud service provider, specializing in the rapid deployment of mission critical applications across a best in class hybrid cloud platform. Combining application expertise with superior service and technical support, Concerto’s cloud platform has been developed for the highest levels of performance, security and speed. When Concerto needed a solution to help ensure the availability and reliability of their customer’s cloud environments, they turned to Evanios. Evanios provides unified monitoring and event management for Concerto’s fully managed cloud infrastructure. By choosing Evanios, which runs natively in ServiceNow, Concerto has a single system of engagement to interact with their customers, which helps provide a consistent user experience, and drives automation. Concerto can auto-provision monitoring as part of their cloud workflow, reducing human intervention and human error completely. 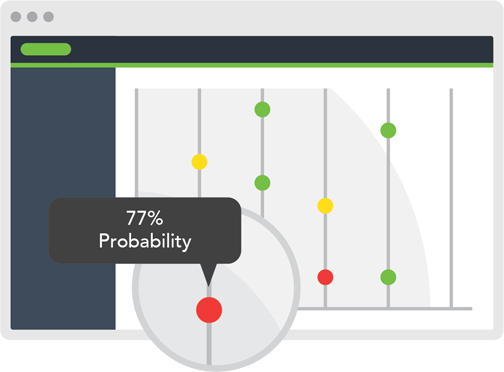 Reporting and dashboards are provided to Concerto clients directly through the ServiceNow interface, so they can interactively explore incidents, changes, metrics, and events from a single, familiar unified view.